Anxiety, stress, and sensory overload are aplenty at Christmas time, especially for autistic kids. Find out how to make your own Christmas calm down kit for kids to help your child survive the holidays! Holidays are super stressful, especially if your little ones get overwhelmed by anxiety or sensory information. So as we get closer to Christmastime, I thought I would put together a Christmas survival calm down kit for kids with autism, sensory issues, or anxiety. This list of calm down tools for kids are Christmas themed and should help you manage or reduce meltdowns during the holiday season. Or, at least, we hope it will help reduce meltdowns! Don't forget to read through my list of 26 holiday survival tips for autism families as well. This list of printables, activities, and ideas are the perfect way to help prepare your child for the stress, unpredictableness, and busyness of the holiday season. There's social stories about Christmas, Christmas visual supports, and lots of practical suggestions on this list that you can use to make a Christmas themed survival kit! 1. Use a Christmas themed visual schedule to help your child know what the holidays will look like for them. I love this Christmas visual schedule for using at home, but for on the go, this set of free printable Christmas visual schedule cards look wonderful too! 2. Help your kids plan Christmas shopping with this free printable Christmas shopping planner flip book to simplify holiday shopping. 4. Pack a travel sensory bag for your child and bring it with you while you travel, visit relatives, or attend holiday gatherings. 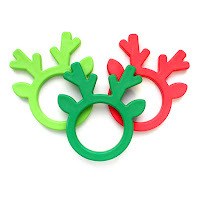 If you want to make a Christmas themed sensory bag, then you'll want to add one of these cute reindeer chewies from Ark Therapeutic. 5. Help your child practice appropriate ways to respond when receiving gifts with this free printable social scripts mini flip book. Hopefully there won't be any awkward comments made about the gifts your kids receive! 6. Read these free social stories about what to expect at Christmas, including visiting family, meeting with Santa, and opening presents with this collection of free Christmas social stories for kids. You can also grab our free printable seeing Santa social story. 7. Make sure your kids get the sensory input that they need over the holidays by using this free printable occupational therapy Christmas calendar. 8. Print off a set of these free printable visual calm down cards and keep them handy while you're traveling. They are a perfect accompaniment to the travel sensory bag (see #4 above). 9. Print off a copy of this free printable letter to Santa and bring it along when you go for a visit or photo with Santa. 10. 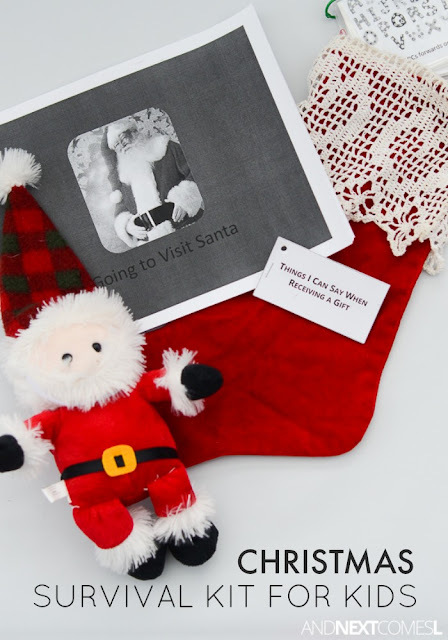 Prepare your child for Santa's visit with this set of free printable Santa sequencing cards. 11. Use this free printable special needs event planner to help your child prepare for any special holiday gatherings or events. It's a great way for them to learn everything the need to know about the event and to help them successfully plan and attend it. 12. Make a Christmas themed quiet book for your kids. It's a perfect way to help keep your kids busy while traveling to holiday functions or if they need a quiet calm down activity during a function. 13. Print off a bunch of our Christmas I spy printables for kids and make a busy book for your kids. It's perfect for kids who need a bit of visual sensory input while on the go! 14. Get practical tips and advice for surviving the holidays with the book Holidays & PTSD: A Parent's Guide to Survival.